There’s a fundamental difference between food that is weird because of its shape or its combination of contents, and food that is weird because of what it simply is. Pepsi AM is strange, but not as strange or troubling as, say, horse meat ice cream. Horse is a delicacy in Japan, but that is only one of many places in which pets get eaten as food. Here are 11 places where pet animals get eaten; you and I cuddle them, but other people would be chowing down on them. Some of these pet/food critters are ones you know well. Dogs, for example, are widely known to be a Korean favorite. 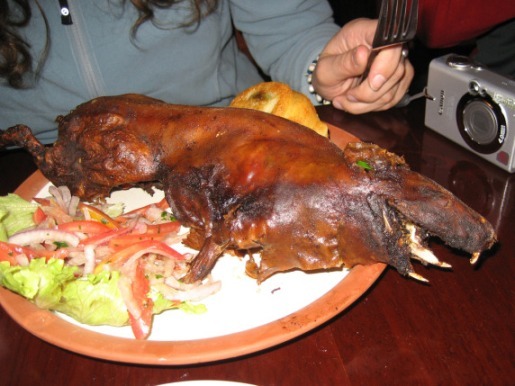 But apparently, people in South America eat guinea pigs and capybara. I knew that Japanese loved to eat horse meat, but didn’t know it was as popular as it was in France. One man’s trash is another man’s treasure; I guess one man’s companion is another man’s dinner, too!